While its vision and mission remain largely unchanged - that Australia and New Zealand lead the world in the sustainable management and remediation of contaminated land and groundwater, the time has come to consider the next decade. What will help ALGA to ensure its continuing relevance and value to members and the broader Australasian community? What must it do to achieve its vision? How will it evolve in anticipation of changing industry practice and knowledge? ALGA 2022: leading in the next decade seeks to build on all that ALGA has achieved and continues to add within the Australian and New Zealand contaminated and groundwater community, and outlines the steps that ALGA will take in reinforcing its position as the peak industry body for that community. ALGA is already recognised as the peak industry body involving and focused on the whole of the contaminated land and groundwater industry, and has over 1870 Members and Corporate Sponsors. ALGA provides services that are valued by its members, including regular meetings and discussion forums, a newsletter, special interest groups, regional conferences and national conferences. These activities will continue to be the core of the services that ALGA provides to the industry. By the end of this 5 Year Plan, ALGA will have further strengthened and broadened its sphere of activity and leadership. Advancing Australasia to lead the world in the sustainable management and remediation of contaminated land and groundwater. ALGA will become the recognised voice of the Australasian contaminated land and groundwater industry and a trusted advisor – demonstrating leadership in the field, both as an organization, a preferred training provider, and through the actions of its members. While ALGA will continue to host regular meetings and forums in many Australasian cities and regional centers, and to organize specialist technical and national and international conferences, ALGA will also begin to support the industry in a variety of other ways (Appendix 1). ALGA recognizes that without its members and volunteers it simply wouldn’t exist. ALGA also recognizes that its strength and capability is based on the breadth of experience of its members and sponsors, in having a collaborative relationship with other professional associations (Appendix 2) that represent specialist areas within the industry, and in recognizing and encouraging professional excellence of our members and other related professional associations. ALGA will compliment and further this by identifying and undertaking projects or activities in partnership with ALGA’s members (Appendix 3), where this will further ALGA’s vision and is likely to provide a better outcome for the industry than if ALGA were not to be involved. A change in organisational structure, to better support the organization, volunteers, members and sponsors in advancing ALGAs vision for Australasia to lead the world in the sustainable management of contaminated land and groundwater. 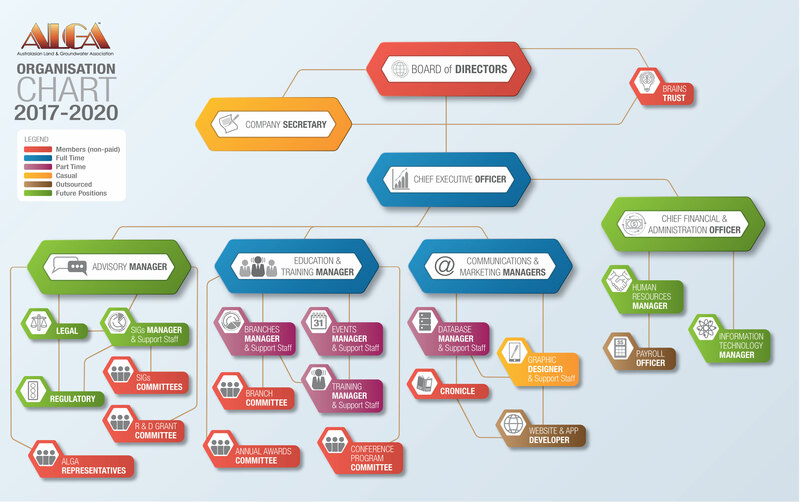 Click here to view 2017-2010 Org Chart. Changes to the ALGA Awards system, to increase the number of opportunities for members to be recognized for all that they bring to the industry. Identifying and undertaking projects and providing services that will further support ALGA to achieve its mission. By 2022, ALGA will have further strengthened its position as the peak body leading the Australasian contaminated land and groundwater industry, and it will have done this in a measured way that continues to support members to be their best, to highlight their achievements to the rest of the world, and to sustainably manage contaminated land and groundwater. You can learn more about how to join us here.